Each fluorescent point of light making up the multicolored rings in this image is an individual human embryonic cell in the early stages of development. Scientists seeking to understand the molecular cues responsible for early embryonic patterning found that human embryonic cells confined to areas of precisely controlled size and shape begin to specialize, migrate and organize into distinct layers just as they would under natural conditions. 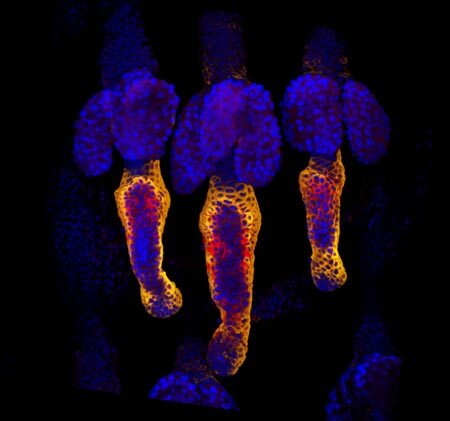 Read the Inside Life Science article to learn more about this research, which has opened a new window for studying early development and could advance efforts aimed at using human stem cells to replace diseased cells and regenerate lost or injured body parts. 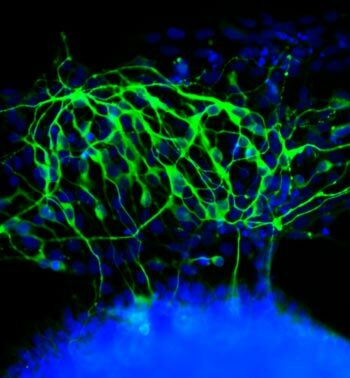 Stem cells grown on a soft surface begin to transform into neurons. Credit: Kiessling Lab, University of Wisconsin-Madison. If you think this image looks like the fluorescent outline of a brain, you’re on the right track. The green threads show neurons that have just formed from unspecialized cells called stem cells. Researchers led by Laura Kiessling of the University of Wisconsin-Madison directed the stem cells to become neurons by changing the quality of the surface on which they grew. In experiments testing different gels used to grow stem cells in the lab, the scientists found that the stiffness of those gels influenced cell fate decisions. When grown on a soft gel with a brain tissue-like surface, the stem cells began to transform into neurons. This happened without the addition of any of the proteins normally used to coax stem cells to specialize into different types of cells. A better understanding of how stem cell fate is influenced by the mechanical properties of a surface could help researchers who are trying to harness the blank slate cells for tissue regeneration or other therapeutic uses. This work also was funded by NIH’s National Institute of Biomedical Imaging and Bioengineering; National Heart, Lung, and Blood Institute; and National Institute of Neurological Disorders and Stroke. 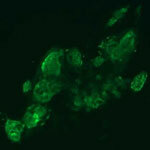 The protein HIF1 alpha is beneficial for creating induced pluripotent stem cells (green) from adult human cells. Credit: Julie Mathieu, University of Washington. Hannele Ruohola-Baker and a team of researchers at the University of Washington recently discovered that two proteins responsible for regulating how cells break down glucose are also essential for stem cell development. The scientists showed that the proteins HIF1 alpha and HIF2 alpha are both required to reprogram adult human cells into pluripotent stem cells, which have the ability to mature into any cell type in the body. Taking a closer look at what each protein does on its own, the researchers found that HIF1 alpha was beneficial for reprogramming throughout the process, whereas HIF2 alpha was required at early stages but was detrimental at later stages of reprogramming. Because the two proteins also play a role in transforming normal cells into cancer cells, the findings could lead to future advances in cancer research. 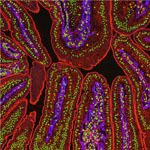 HB-EGF has the potential to protect the intestines (magnified here) from different types of injury. Credit: National Center for Microscopy and Imaging Research. Gail Besner of Nationwide Children’s Hospital and her research team recently found out how the HB-EGF growth factor protein could potentially aid the development of treatments for a number of conditions. Using model systems in two separate studies, the scientists discovered that HB-EGF could protect the intestines from injury by stimulating cell growth and movement and by decreasing substances formed upon intestinal injury that worsen the damage. 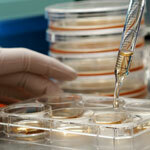 They also showed that administration of mesenchymal stem cells could further shield the intestines from injury. Future treatments involving a combination of HB-EGF and stem cells could, for example, help cancer patients sustain fewer intestinal injuries resulting from radiation therapy. This work also was funded by NIH’s National Institute of Diabetes and Digestive and Kidney Diseases. Listen to Gail Besner talk about this and related research in her lab. Read transcript. Genetically engineered human stem cells hold promise for basic biomedical research as well as for regenerative medicine. Credit: Jeff Miller, University of Wisconsin-Madison. 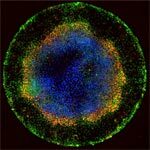 Human pluripotent stem cells (hPSCs) can multiply indefinitely and give rise to virtually all human cell types. Manipulating the genomes of these cells in order to remove, replace or correct specific genes holds promise for basic biomedical research as well as medical applications. But precisely engineering the genomes of hPSCs is a challenge. A research team led by Erik Sontheimer of Northwestern University and James Thomson of the Morgridge Institute for Research at the University of Wisconsin-Madison developed a technique that could be a great improvement over existing, labor-intensive methods. Their approach uses an RNA-guided enzyme from Neisseria meningitidis bacteria—part of a recently discovered bacterial immune system—to efficiently target and modify specific DNA sequences in the genome of hPSCs. The technique could eventually enable the repair or replacement of diseased or injured cells in people with some types of cancer, Parkinson’s disease and other illnesses. This work also was funded by NIH’s National Center for Advancing Translational Sciences. After deriving induced pluripotent stem cells (iPSC) from the cells of a person with Down syndrome, researchers inserted the XIST gene to silence the third chromosome 21 copy. Credit: Lawrence lab. Each year about 1 in 700 babies is born with Down syndrome, a condition that occurs when cells contain three copies of chromosome 21. A new technique offers a proof of principle for silencing the extra copy. 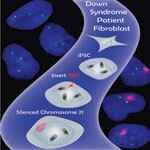 Using induced pluripotent stem cells derived from a person with Down syndrome, a research team led by Jeanne Lawrence of the University of Massachusetts Medical School inserted a gene called XIST into the extra chromosome 21. The gene, which normally turns off one whole X chromosome in females, rendered the chromosome copy and most of its genes inactive. The researchers plan to test the approach in a mouse model of Down syndrome and use it to further explore the biology of chromosome errors. The findings could eventually aid the development of therapies to mitigate resulting medical problems. This work also was funded by NIH’s National Cancer Institute and Eunice Kennedy Shriver National Institute of Child Health and Human Development.